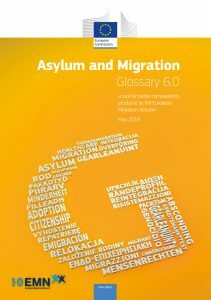 The EMN Glossary – as one of the key products of the EMN – improves comparability by enabling a common understanding and use of terms and definitions relating to asylum and migration. The Glossary draws on a variety of sources, but primarily on the legislation of the EU asylum and immigration acquis, and makes terms available in the majority of EU Member State languages. While remaining its main focus on legal developments in the framework of the EU acquis on asylum and migration, the Glossary also increasingly considers developments in the external dimension, at the same time acknowledging the needs of practitioners working in the field. As in the past, it also considers the terminology used in recent EMN studies amongst other key documents. Each glossary entry is comprised of a preferred term, a definition of the concept that this term represents, the source/sources of the definition, plus notes and relationships to other terms (synonyms, broader and narrower terms as well as related terms) included in the Glossary. The online version is regularly updated. Printed versions are only published if they contain substantial changes. The last version was published as the EMN Glossary V6 in May 2018 and is available on website, please click (…). For download as an interactive pdf version, please click on below document. The EMN Glossary version is avaliable beside English, also in the following EU languages Spanish, French, Italian, Arabic, Portugese, Lithuanian, Detuch and Suomi. More information about the methodology of the glossary, please click (…).